A New Kind Of Freestyle Motocross, Nuclear Cowboyz! While this idea is not totally new, freestyle motocross competitions are sometimes a difficult thing to pull off. It really is kind of an art form when the riders jump through the air doing their various tricks as well as a competition. They are judged based on certain criteria, sometimes it's consistent, sometimes it's not. Sometimes bigger tricks win, sometimes consistency, sometimes quantity..flow etc. It's definitely a lot more about entertainment than say a motocross would be. The competition is a fun part of it, buy why not do a show just, on a larger scale, based on entertainment value? Enter the Nuclear Cowboyz! The Nuclear Cowboyz tour has assembled the world’s greatest cast of freestyle motocross riders. 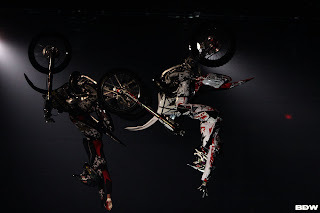 It will feature whole new freestyle motocross experience with the best FMX riders in the world performing together in one "explosive theatrical production". Nuclear Cowboyz will "ignite the arena floor with freestyle motocrossers defying gravity, leaving the audience with an unbelievable adrenaline-rush". At first I had mixed thoughts, but then I wondered what I really go to a freestyle competition for. I sometimes get tired of just seeing guys rush around in their allotted time to pull off the "most difficult" tricks to get the most content in one run, or going in a figure 8 hitting the same ramps over and over. Sometimes the best tricks are a great whip..not judged very highly though. This format could be really cool. Multiple riders will take the stage and concentrate more on entertainment value than the most technical tricks that get the most points from the judges. There will be other performers etc. besides the riders as well. Here's a clip from the bike of Mike Mason during practice as well as a few pics from practice. Tell me this doesn't look fun! Unfortunately, the stops are limited and they will not be stopping in Utah. Here's a schedule of the stops they'll make starting this January! Awesome!, I'll be sure to tune in!